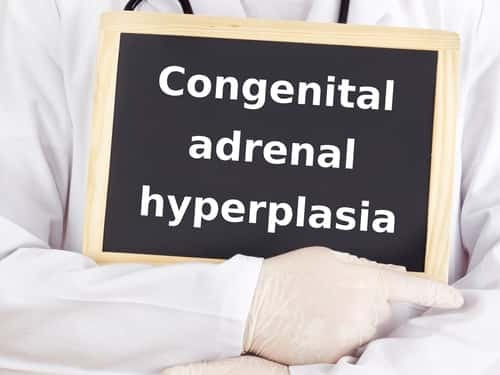 Congenital adrenal hyperplasia (CAH) is a family of inherited, autosomal recessive disorders marked by enzymatic deficiencies that reduce the production of cortisol, aldosterone or both. CAH affects 1 in 10,000–18,000 children and may be diagnosed prenatally or at birth.1 Researchers use the steroid precursor 17-hydroxyprogesterone (17-OHP) for investigations related to CAH, which generally requires quantification by immunoassay; however, antibody cross-reactivity with structurally similar compounds may skew the results. For this reason, scientists turn to liquid chromatography–tandem mass spectrometry (LC-MS/MS) for the selective quantification of steroid analytes. Gervasoni et al. (2014) applied TurboFlow online sample preparation technology (Thermo Scientific) coupled with MS/MS for this purpose.2 To do this, they protein precipitated 100-µL serum samples from 64 donors with 100 µL of internal standard solution (17-OHP-d8 1 ng/mL in methanol). Following centrifugation, they injected the supernatant into a TurboFlow Technology-equipped instrument fitted with a Cyclone TurboFlow column (50 × 0.5 mm) for online extraction. The team used a Kynetex C-18 XB column (100 mm × 2.10 mm) for chromatographic separation and a TSQ Vantage triple quadrupole mass spectrometer (Thermo Scientific) in highly selected reaction monitoring mode for detection. For 17-OHP, they monitored transitions for precursor at m/z 331.3 and products at m/z 97.1 and 109.1. For 17-OHP-d8, they began monitoring for precursor at m/z 339.2 and for product at m/z 100.2. The researchers relied on Xcalibur (2.0.7, Thermo Scientific) for data analysis. The team determined a retention time of 5.9 min with no observable interference. Over a concentration range of 0.02–10.0 ng/mL, linear calibration curves persisted, with correlation coefficients above 0.99. They noted a lower limit of quantification of 0.02 ng/mL and a value for total imprecision below 5%. In comparison with classic immunoassay, Gervasoni et al. found a mean difference of 0.67 ng/mL between the two methods and noted that the variation was a function of differences in analyte concentration, as revealed by Bland-Altman plotting. Linear regression analysis showed good agreement between the methods, with a correlation coefficient of 0.892. Overall, the scientific team found this approach to be simple and selective for 17-OHP quantification in clinical settings. They posit that online sample extraction reduces interference introduced by the matrix and limits intervention by the user; this not only addresses the challenges associated with traditional immunoassay, but also increases both time- and cost-effectiveness for the clinical laboratory. 1. Zieve, D., and Eltz, D. (2014) “Congenital Adrenal Hyperplasia,” Medline Plus, U.S. National Library of Medicine, National Institute of Health, available at http://www.nlm.nih.gov/medlineplus/ency/article/000411.htm. 2. Gervasoni, J., et al. (2014) “Development of a TurboFlow LC-MS/MS Method for Quantitation of 17-Hydroxyprogesterone In Human Serum,” Thermo Scientific Poster Note 5, PN-MSACL-2014-Hydroxyprogesterone-Hornshaw_E_03/14S.